It’s the Christmas holiday weekend in Vegas and the town is full of festive things to do. Take in a special holiday-themed show, visit one of Vegas’ many holiday attractions or celebrate Christmas with an amazing meal in one of our top restaurants. If you’re not really into the spirit of the season, don’t worry – we have plenty of other entertainment choices for you like big comedy stars, rock music and pop diva Britney Spears. 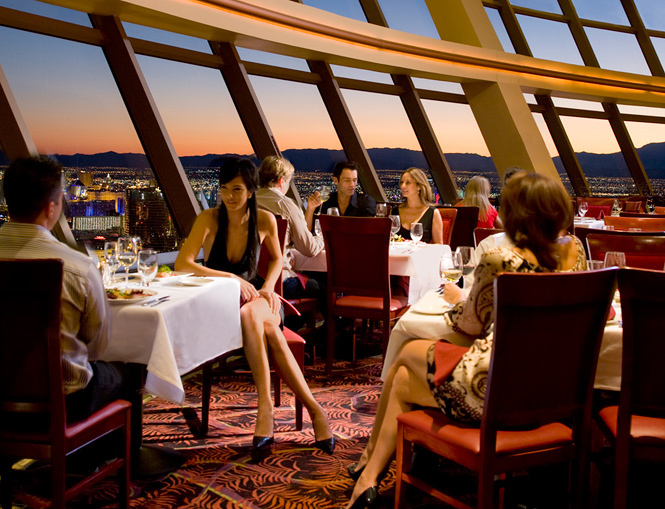 Enjoy a holiday dinner and a great view at Top of the World, photo courtesy of Stratosphere. Enjoy four courses (and a great view) at Top of the World at the Stratosphere on Dec. 24 and 25. Menu items include baby red romaine, grilled treviso and roasted fig salad, creamy cauliflower soup with exotic madras curry oil and roasted prime rib with chestnut butter. Dessert is warm bread pudding with whiskey sauce and vanilla ice cream. Top of the World’s holiday menu is available on Dec. 24 and 25 from 11 a.m. to 11 p.m. for $85 per person. Chef Emeril Lagasse’s Table 10 restaurant in The Palazzo’s Grand Canal Shoppes has Christmas covered with a special menu including chilled Maine lobster for $20; winter citrus salad with hearts of palm and arugula for $12; sea salt and herb-crusted bone-in prime rib with black truffle jus for $49; and warm caramelized apple and gingerbread cobbler with mascarpone ice cream for $11. Table 10 will be open Dec. 24 from 11 a.m. – 9 p.m. and Dec. 25 from 12 p.m. – 10 p.m. Studio B Buffet at M Resort will host its Holiday Feast to Remember through Jan. 3. Menu selections will include roasted turkey, prime rib, crab legs, roasted rack of lamb, an oyster bar, crab-stuffed sole, kalbi short ribs, shrimp with lobster sauce, cocktail shrimp, New England clam chowder and lobster bisque. Guests dining Dec. 24 – 25, will also enjoy an omelet station from 11 a.m. to 3 p.m., a risotto station from 3 to 8 p.m. and complimentary champagne. Guests who dine on Christmas Day will also enjoy a whole roasted suckling pig. The Holiday Feast to Remember is priced at $39.99 per person. Piff the Magic Dragon will be performing his “Piffmas Piff-Tacular” during the holidays, photo courtesy of Vegas.com. Several shows in Vegas are making spirits bright with special holiday-themed performances. Get into the holiday spirit with “Tournament of Kings” at Excalibur. Their holiday production, “Twas the Knight!,” features holiday decorations, carolers singing holiday songs, a special meal and more. The show runs through Dec. 28 Wednesday – Thursday and Saturday – Sunday at 5:30 p.m. and 8 p.m. and Monday and Friday at 5:30 p.m.
“America’s Got Talent” star Piff the Magic Dragon has been performing his solo gig at the Flamingo and during the holidays he’ll have a special show, “Piff’s Piffmas Piff-Tacular.” We don’t really know what sort of holiday things will happen but Piff promises to “spread festive joy and good cheer like a particularly irritating rash.” The 8 p.m. show runs through Dec. 30. Check out the cactus garden at Ethel M, decked out in half a million lights. Photo by Ashley Oñoz-Wright/Vegas.com. Vegas doesn’t get too terribly cold in the winters compared to the rest of the country but we still like to celebrate the season, desert-style. 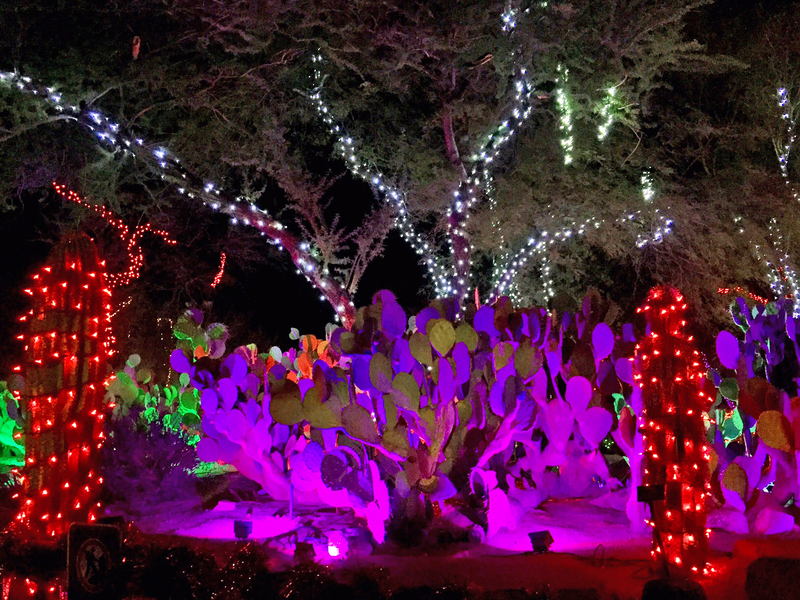 Head out to the Ethel M Chocolate Factory in Henderson to see a dazzling display of lights covering every inch of the three-acre cactus garden. That’s more than half a million lights. Hey, we like lights in Vegas. You can see the display through New Year’s Day. The Bellagio Conservatory gets decked out every year for the holidays and this year that means a larger-than-life snow globe, a 42-foot-tall live tree, playful polar bears made of carnations, penguins, and a giant rocking horse. There’s also a snow tunnel to walk through and twirling toy soldiers. See the festive display through Jan. 3. If you really need your fix of snow and ice while you’re in Vegas you can find it at The Cosmopolitan of Las Vegas. Go the rooftop Boulevard Pool and check out the ice rink, faux snow flurries, firepits, s’mores and festive hot drinks. Get your skate on through Jan. 3. 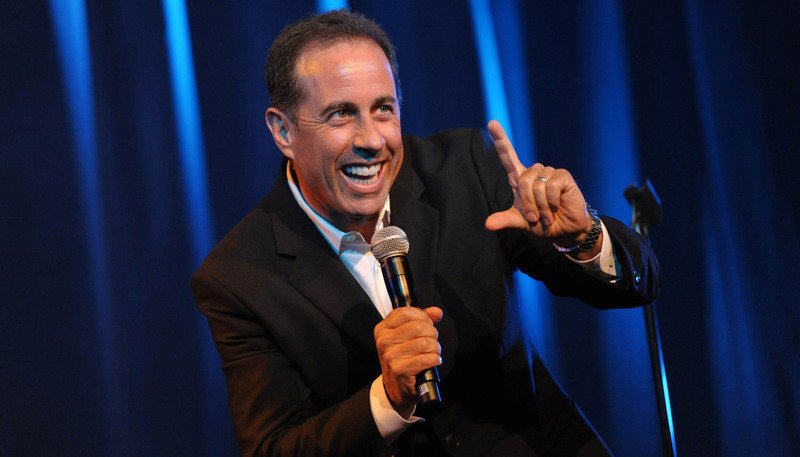 Comedian Jerry Seinfeld brings the laughs to Caesars Palace this weekend, photo courtesy Vegas.com. If all the holiday cheer isn’t your cup of tea, you can always see a show that’s pretty much the complete opposite of holiday cheer. Lisa Lampanelli, known as the “Queen of Mean,” brings her sarcastic and biting wit to the Venetian Dec. 26. Her show isn’t for the faint of heart. Lampanelli is an expert at roasting people and she’s not afraid to take aim at lots of audience members. For something a little more mellow, but still just as funny, Jerry Seinfeld is also in town Dec. 26 – 27. He’ll be making audiences laugh with his unique brand of observational humor that has made him a huge stand-up and television star. Pop princess Britney Spears sings all her hits at Planet Hollywood, photo courtesy of Vegas.com. 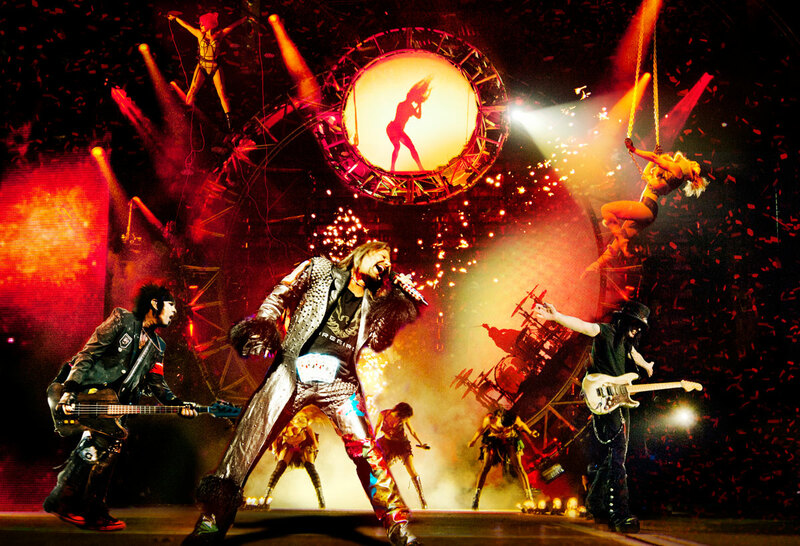 Mötley Crüe rocks Vegas one last time, photo courtesy Vegas.com.